In discussions of how to improve wireless range and coverage, the subject of higher-gain antennas usually comes up. Higher-gain antennas seem to be a better choice than looking for routers with higher transmit power because antenna gain applies to both transmit and receive signals. This is because Wi-Fi is a two-way communications medium, being able to "shout louder" (amp up router transmit power) helps only if the router can hear the faint reply of weaker client devices. 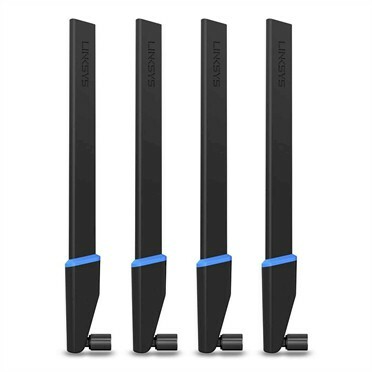 Linksys' High-Gain Antenna comes in packages of two (WRT002ANT) and four (WRT004ANT) that have MSRPs of $79.99 and $99.99, respectively. But Linksys knows that's a tough sell, because they are selling them for $59.99 and $129.99 on the Linksys website. Linksys sent the four-pack as the review sample, with all four antennas tucked into a plastic tray but no documentation other than that printed on the box. The product and support pages contain no user manual, but do have a link to a Getting to know the Linksys WRT High Gain Antennas article. The feature bullets and specs below come from that page. I highlighted two key points above that buyers who only read the product box would not be aware of. The reason for the limitations makes more sense once you read the spec shown below, found only on the product page. The thing about antenna gain is that it comes at the expense of beamwidth. The only antenna that radiates (or receives) in all directions equally is the isotropic, or ideal, which doesn't exist. Its radiation pattern looks like a perfect sphere, i.e. equal power in all directions. The antenna pattern of the half-wave dipole "omnidirectional" antenna that is used by many routers is different when viewed from the top (azimuth plane) and side (elevation plane). From the top, it looks (or should look) like a perfect circle. But from the side it looks more like a donut. The example patterns below from a Cisco Antenna Patterns and Their Meaning whitepaper, illustrate this clearly. The pattern on the left is typical of the garden variety half-wave stick or "rubber-duck" dipole. Its ideal gain should be 2.2 dBi (you'll also see 2.1 / 2.14 / 2.15 used—they're all the same). The pattern on the right shows a "high(er)" gain dipole, with a gain of 5.8 dBi. The azimuth plane is again a circle, just like the dipole. But the elevation plane is flatter, i.e. it has a narrower beamwidth. An ideal half-wave dipole has a beamwidth of 78°. Note that dual-band antenna patterns (and gains) will be different for each band. For the Linksys High-Gain, the spec is up to 4 dBi in 2.4 GHz and up to 7 dBi in 5 GHz. Take note of the "up to"; there is no minimum or even typical gain specified. So the antennas could have no additional gain over 2.2 dBi and still be within spec! So, long story short, since Linksys' High Gain antenna has a 30° beamwidth—about half that of a plain ol' dipole—it might actually provide worse coverage to floors above or below it, depending on the effective angle between router and device. Hence, the "designed for single story environment" caveat. The photo below shows the High-Gain is almost 2 1/2 times the size of the stock WRT antenna. If you have your WRT1900AC on a shelf, you better check the available height before you order them. The 288.56 mm length spec above translates to 11.4 inches for the metrically impaired. The High-Gain uses the common RP-SMA connector found on pretty much all consumer routers and access points that have replaceable antennas. Installation is easy, just screw off the old antennas and screw on the new. I suggest you shut off your router when you do this, so that the router can properly account for the change in gain if it's capable of doing so.